Welcome to the grand opening of the Grand Emporium! 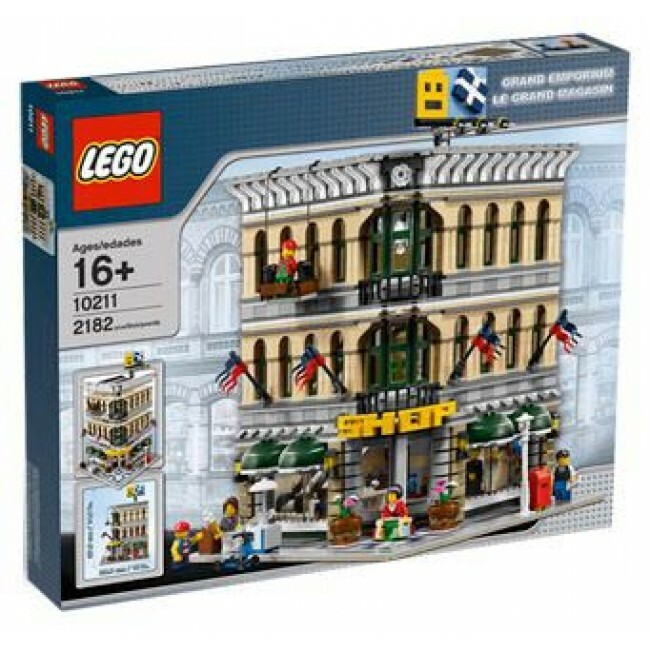 The LEGO Modular Buildings series continues with this spectacularly detailed 3-story department store, designed in a realistic scale with lots of special building techniques and rare pieces. On the street outside, citizens carry shopping bags, send letters at the mailbox, admire the window mannequins, then cool off at the ice cream stand while a busy window washer works above. Enter through the revolving doors to discover a ground-floor clothing department, complete with a cash register, fitting room, hats, jewelry, perfume, and even a selection of spare trousers. A brick-built escalator carries customers to the second floor housewares department with glassware and golden plates for special occasions, and then it’s up to the top floor for the toy department (complete with toy house and push-scooter) with an impressive chandelier above the open atrium. Up on the roof are a billboard and skylight!